The surface mount is as its name implies, mounted on the surface of the door/window with wiring exposed. A door contact is the most basic of alarm triggers. These are just magnetic strips that are in contact while the door is closed but break the circuit when the door is opened. Then it triggers the alarm. 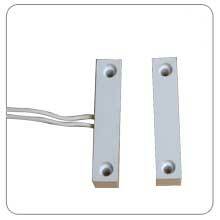 Surface Mount Magnetic Sensor are used on closed circuit alarm systems. These devices work through a magnets, so when the magnets are lines up, the switch is closed. These types of devices are meant to be an easy to install option for windows and doors that open. Below are the pros and cons of these devices and alternatives to using them. Ease of installation: These devices are typically mounted through an adhesive that sticks to the door and the frame. They can also be mounted with wood or sheet screws depending upon your door or window you plan on installing it on. Cheap: These devices are normally very cheap, the biggest cost with them is the installation and wiring if they are used on hardwired alarm systems. Reliable wireless devices an option: There are reliable wireless surface mounts that are more expensive than the hardwired ones, but can allow you to quickly install them without running wires and paying someone house of installation fees. Visible: They are not aesthetically pleasing to the eye in residential settings. Subject to tampering: Since they are visible, it makes the more subject to tampering with. It can also alert burglars of the type of contact sensors you use and they may be able to find a window or door without them since they know they are not mounted inside of the door or windows. Since the biggest downfalls of these devices are that they are not aesthetically pleasing and are subject to tampering there is a device called a recessed contact. This device woks pretty much the same way as the surface contact but the magnets are installed inside the frame and the door.